WHY MOVE THE BATTERY IN THE FIRST PLACE? As usual I will begin by stating my reasons for wanting to move the battery from the OE location. There are several. The first is rather simple as it applies to the dynamics of car control. A car with weight hung outside the wheel base of the car will not be as responsive as one with that same weight placed within the wheelbase (polar moment of inertia). The battery, essentially a 50lb chunk of lead and liquid is placed right on the front left corner of the car, ugh. My desire is to move it to the middle of the car placed in the location previously occupied by the passenger side rear bin. The second reason is one pertaining to cooling efficiency. As it is well known cooling an RX-7 under all conditions, be it street or track driving, can be a challenge. The battery sits directly over the left side of the radiator effectively blocking airflow. 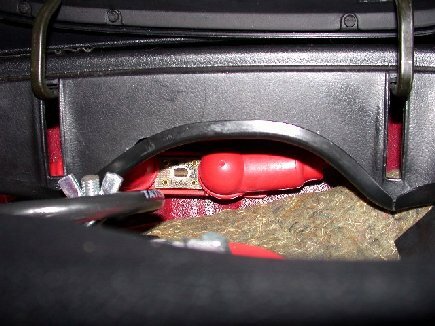 Additionally the battery acts as a heat sink so once hot does nothing more that radiate heat into the engine bay delaying the time it takes to cool the car down, whether it is moving or stopped. 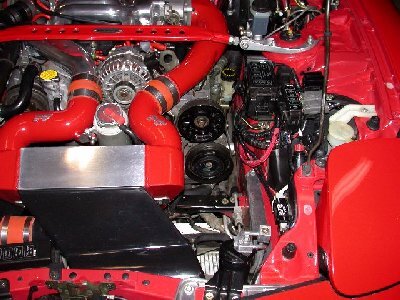 And the final reason is that if one desires to utilize a large intercooler the battery either must be relocated or replaced with a mini battery of some sort. So thus in my opinion it was time to have a go at moving the battery. But you will probably ask why not use one of the battery miniturization kits (aka BMK)? Well, being the person that I am I frequently run the fans with the engine off for long periods of time - I forget. So have killed my stock battery many a time. The mini batteries are just fine for running the car but if the car doesn't start by the 3rd try...give or take..then it's done. The BMK's have the capacity to start the car but not the reserve to run auxilliaries for long periods of time. I feel I need the reserve. What did I purchase to facilitate the install? A Blue Sea Marine ANL fuse holder with a 150Amp ANL blade fuse, also for about $40. My total cost for the install was about $200 when all was said and done. So on to the relocation effort. auxilliary ground cable, reterminating accessory wiring to fit main fuse block lugs, etc. etc. Remove stock battery. Look at all that space! IC upgrade? Stand and stare at wiring mess for 30 minutes trying to figure out what the hell to do with such a disaster area. End up disconnecting virtually every connector in the vicinity and rerouting everything. Take a breather and look at what is ahead. Remove rear hatch carpet.... and then the fun begins. Try to remove two side panels. Ummm not without removing the roll bar!! RATS! WHEW! The Half Way Point...Sorta Install battery tray. Drilled 4 holes through floor pan and used some hefty 3/8inch bolts. Figure out where to attach ground cable and install it. And lo and behold there is an M12 prethreaded hole already right next to the where the battery will go - apparently used for seat belt anchors for cars fitted with rear seats. 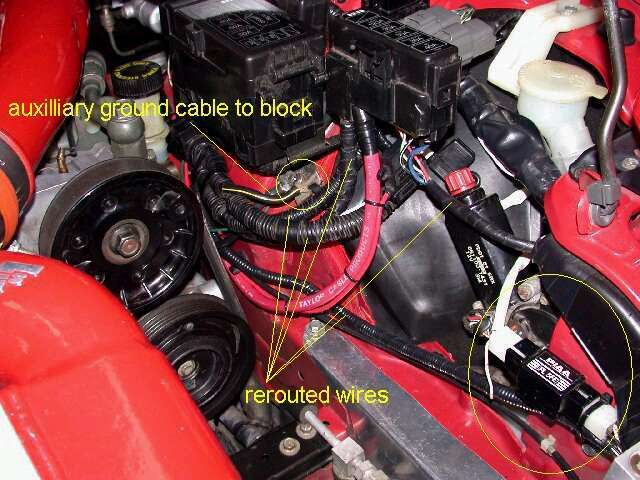 Jack up car to run cable. I used the route taken by the brake and fuel lines under the car. Took a bit of fiddling around but it works and it keeps the high power battery cable away from the main wiring harness. 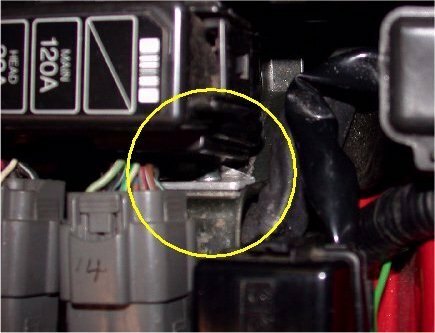 Cut positive lead and splice in ring terminals to route through fuse block near battery. 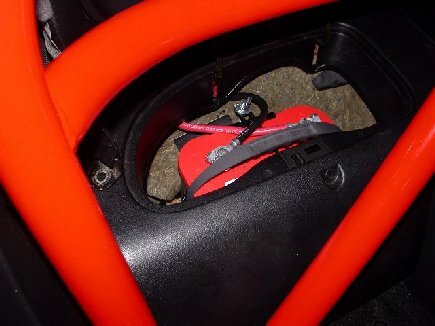 For safety measures the fuse block needs to mounted no more than 16 inches from the positive battery terminal. And then the fun begins....measure, and measure again and again where the bin must be cut in order to clear the battery. After much procrastination the bin is cut. Clearence is spot on, whew! Reinstall bins (more on this later) while fighting to hold roll bar out of the way. Reinstall pass side rear side panel - 7 of 8 clips catch and one won't grip. Decide to press on. Reinstall remaining clips and screws that hold panels in and do a test fit fo the center divider panel. It DOESN"T FIT! AAAAARRRRRRGGGGHHHH. Reinstall side panel which now fits perfectly. MORAL: if it doesn't fit right then something IS wrong. Reinstall all the clips and screws that go with it. THE NEXT DAY - Final Steps Towards Completion. Reinstall seats. 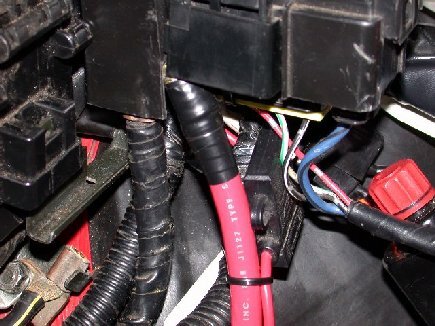 Terminate positive cable and bolt it to main fuse block in engine compartment. Now this was tricky. How does one solder on a ring termal to a 2 gauge wire when all you have is a pencil soldering iron? Well with a butane torch. Actually I drilled avery small hole in the ring terminal casing and heated the tip of the terminal with the cable end inserted in the terminal. Then it was simply a case of feeding in the wire solder through the hole until the terminal was completely full of liquid solder and had fixed the cable end in place. Terminate old negative battery cable at the first grounding point and run an auxilliary ground cable from the chassis to the block. Connect battery in rear and hope the car doesn't instantly fry itself. Breath sigh of relief and no sparks or burning smell is noted when key is inserted for the first time and swear it's a job I'd rather not repeat! Well not so fast. After the battery relocation effort about a week later I decided to take the car out for a spin. Started up fine as usual but... ...the car just didn't seem to be running well. Had good boost, had fuel, but also had what felt like a miss at part throttle and a hesitation off idle. Also lower than usual vacuum (11-13 vs 15-17) and no real power above 4.5k rpm. Made all the right noises though but it just felt like I was dragging a truck behind me. There were no error codes either. Well it turns out I had a bad connector pin at the ignitor going to the coil. Resulting in a car running on only 2 spark plugs! In the process of running the battery cable I must have pulled a wee bit too hard on one of the cables and dislodged the pin in the connector. With the connector now fixed the car runs well, just like it used to. On a much more refeshing note when I removed the bins for the first time much to my amazement there was a piece of Japanese newsapaper, from 1992. The line worker in Hiroshima apparently must have just come off his break when working on my car and left a peice of the newspaper in the car when it was being built. Pretty cool I think.